2 yard pack, Marvel Comics Group fabric features Spiderman, Captain America, Hulk, Iron Man, and Wol..
Marvel Comics Avengers Assemble Badges cotton fabric features Marvel Comics Avengers on a blue cotto..
Marvel Comics Black Panther Action Dark Slate Blue cotton fabric features Marvel Comics Black Panthe..
Marvel Comics Black Panther Badge Design cotton fabric. Fabric for quilting, sewing, craft, and home..
Marvel Comics Black Panther Graffiti Fleece fabric. This fabric is great for no-sew blankets, and cr..
Marvel Comics Black Panther Wakanda Warriors Pics cotton fabric features Marvel Comics Black Panther..
Black Widow Power Hero fabric features Marvel Comics Black Widow posed with her name tossed with sco..
Marvel Comics Captain America Comic Book Cover Panel, Fabric for quilting, sewing, craft and home de..
Marvel Comics Iron Man Comic Book Cover Panel, Fabric for quilting, sewing, craft and home decor pro..
Marvel Ant Man All Over fabric features Ant Man face shot, and on a flying ant with the words Ant-Ma..
Marvel Ant Man Toss fabric features Ant Man in various action poses tossed with the words Ant-Man wi..
Marvel Comics Ant Man Fabrics, Marvel Comics Ant Man Running Cotton Panel, Fabric for quilting, sewi..
Marvel Comics Avengers Assemble fabric features The Hulk, Captain America, and Iron man on a light b..
Marvel Comics Avengers Busting Out Black Fleece. This fabric is great for no-sew blankets, and craft..
Marvel Comics Avengers Character Toss cotton fabric features Marvel Comics Avengers on a black backg..
Marvel Comics Avengers Comic Action cotton fabric features Marvel Comics Avengers on a speckled blue..
Marvel Comics Black Panther Toss cotton fabric features Marvel Comics Black Panther on a blue-green ..
Marvel Comics Black Panther Wakanda Warriors Cotton Panel, Fabric for quilting, sewing, craft and ho..
Marvel Comics Character Tiles Cotton fabric features Marvel Comics super hero youths on tiles. Fabri..
Marvel Comics Hero Portrait fabric features portrait drawings of Spiderman, Thor, The Hulk, Captain ..
Marvel Comics Heroes Group fabric features Captain America, Hulk, Iron Man, Spiderman, Wolverine and..
Marvel Comics Kawaii Superheroes Stars cotton fabric. 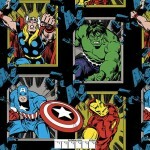 Fabric for quilting, sewing, craft, and home d..
Marvel Comics Superhero Group Gray fabric features Thor, The Hulk, Captain America, and Iron man on ..